The French deserve much praise for their taste in arranging fruits for the table. They almost invariably serve them with leaves, even resorting to artificial ones in winter. In the following arrangements, I have some of their dainty dishes in mind. The French serve large fine strawberries without being hulled. 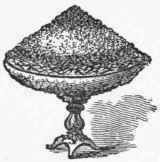 Pulverized sugar is passed, the strawberry is taken by the thumb and finger by the hull, dipped into the sugar, and eaten. The Wilson strawberry, however, which seems to be our principal market strawberry, certainly requires stemming, and deluging with sugar before serving. Always choose a raised dish for fruits. Arrange part of the clusters of grapes to fall gracefully over the edge of the dish. 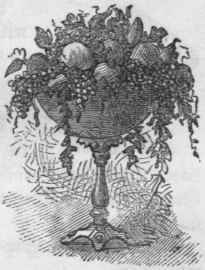 Mix any kind of pretty green leaves or vines, which may also fall, and wind around the stem of the dish. Although the colors of the fruits should blend harmoniously, and the general appearance should be fresh and négligé, arrange them firmly, so that when the dish is moved there will be no danger of an avalanche. A water-melon should be thoroughly chilled; it should be kept on the ice until about to be served. 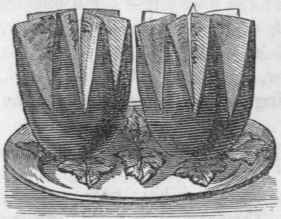 It may be simply cut in two, with a slice cut from the convex ends, to ena-ble the halves to stand firmly on the platter. 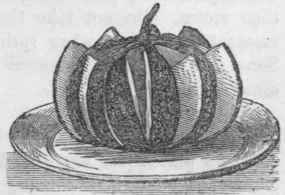 When thus cut, the pulp is scooped out in egg-shaped pieces with a table-spoon and served; or it may be cut as shown in figure, when slices with the rind attached may be served. Put it into the refrigerator until just before serving, to become thoroughly chilled; cut it as in figure here given, removing the seeds. Arrange four or five grape leaves on a platter, upon which place the melon. Serve currants in rows of red and white, with a border of leaves around the outside, as shown in annexed cut. Beat the white of an egg barely enough to break it. Dip in selected bunches of fine currants, and while moist roll them in pulverized sugar. Place them on a sieve to dry. This makes a refreshing breakfast dish. Plums, cherries, grapes, or any other fruit may be iced in the same way.